A look at the famous explorer’s true motivations for undertaking his journeys. Left-wingers view Christopher Columbus’s forays to the “New World” as the original sin of imperialist, capitalist exploitation of indigenous peoples living in a heretofore untouched paradise. 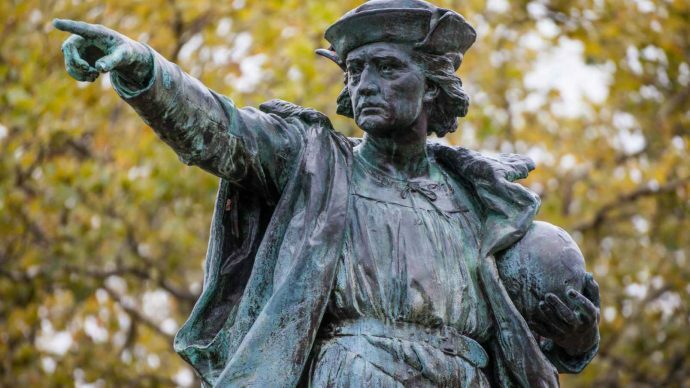 There are calls to replace “Columbus Day” with “Indigenous Peoples Day.” Statues honoring the intrepid explorer have been vandalized, with the New York City-based Revolutionary Abolitionist Movement threatening more destruction. “For the occasion of Columbus Day, October 9th, one of the most vile ‘holidays’ of the year,” its website warns, “the Revolutionary Abolitionist Movement is calling for collectives all over the country to take action against this day and in support of indigenous people in the US and abroad who have been victims of colonialism and genocide.” Ironically, the leftists demonizing Columbus and calling for removal of memorials celebrating his explorations are following in the footsteps of the Ku Klux Klan, who did the same in the 1920’s. In contrast, President Donald Trump proclaimed this Monday as Columbus Day without any of the revisionist, multicultural gibberish that appeared in Barack Obama’s 2016 proclamation. President Trump’s proclamation noted that “the permanent arrival of Europeans … was a transformative event that undeniably and fundamentally changed the course of human history and set the stage for the development of our great Nation.” He called Columbus a “man of faith, whose courageous feat brought together continents and has inspired countless others to pursue their dreams and convictions — even in the face of extreme doubt and tremendous adversity.” In short, President Trump recognized Columbus as an extraordinary man of his time who set in motion a chain of events that would lead ultimately to the creation of the world’s leading beacon of hope, opportunity and freedom.